So, how is your Halloween decorating coming along? If you're behind like us, don't worry. There is a quick, easy, and cheap solution for you. I used supplies already at my house. Although this is a brilliant idea, it was not mine. Check out these other adorable doors from Good to Know. The mouth and burrowing eyebrows are blue painters tape. For the hair, we used three different colors of crape paper. We taped it to the top of the door. The eyes were drawn with sharpie on the back of paper plates. The kids helped, we didn't create a mess, and the house is now decorated for Halloween. Perfection! 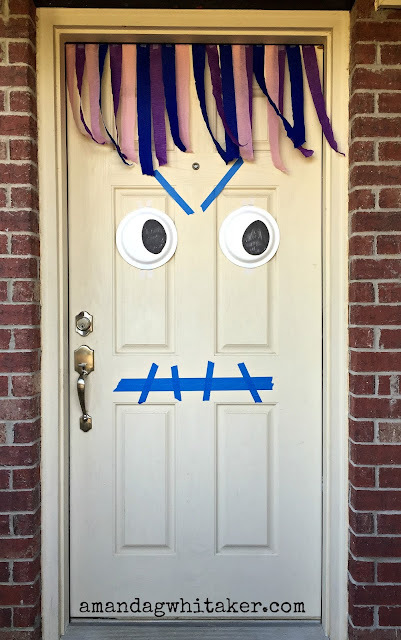 I am totally doing this to our door for trick or treating tomorrow! Thanks for the great idea!